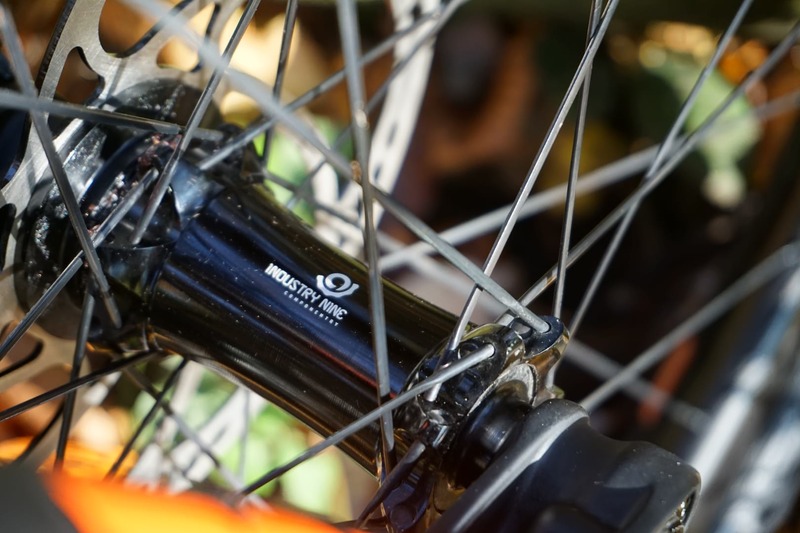 Originally announced back in April this year, the Hugene is Propain’s first foray into the world of 29″ wheels. 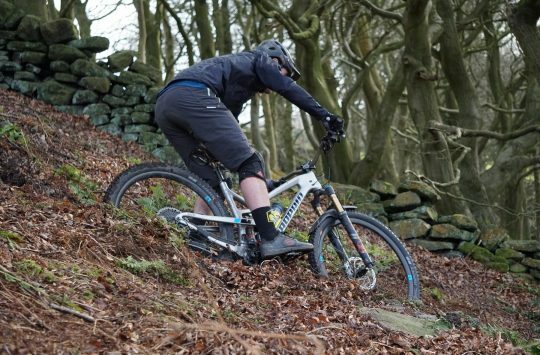 Cited as ‘Propain’s interpretation of the perfect trail bike’ we’ve just had this 130mm travel, trail tamer turn up for a long term test to see how it stands up to a winter of Yorkshire loam (mud!!). 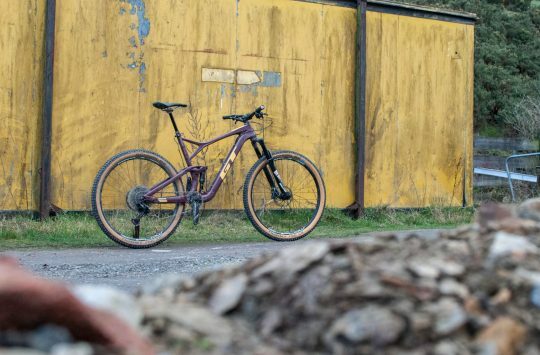 Known for their carbon bikes, the Hugene is no different from the rest of the Propain range and has a full carbon frame, and utilises their PRO10 suspension system to deliver 140mm of composed rear end bounce. 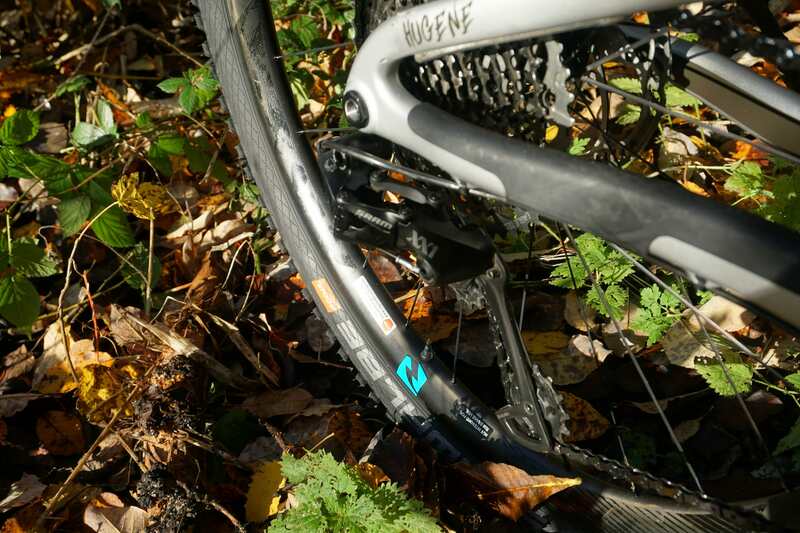 Key numbers include a 67° degree head angle, 74.5° seat tube and 457mm reach. Unlike other models in the Propain range, the shock on the Hugene has been moved in front of the seat tube, as opposed to behind, getting it out of the way of mud and trail detritus, and freeing up plenty of space for mud clearance. 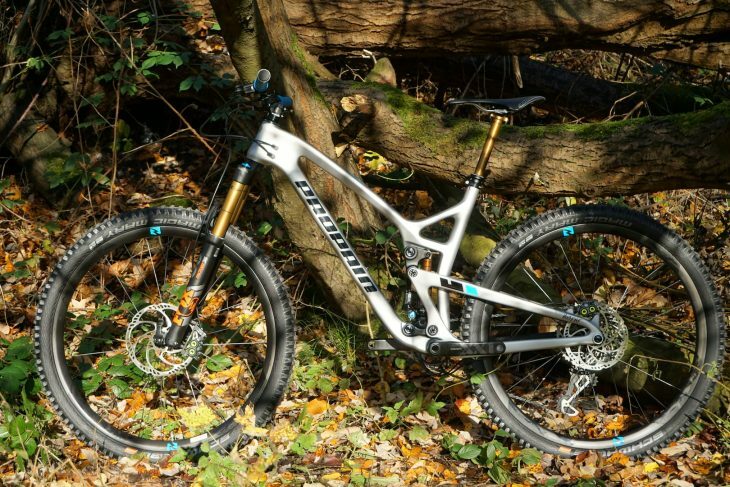 The carbon frame features full internal routing for all hoses and cables and even has routing for a front mech – remember them?! 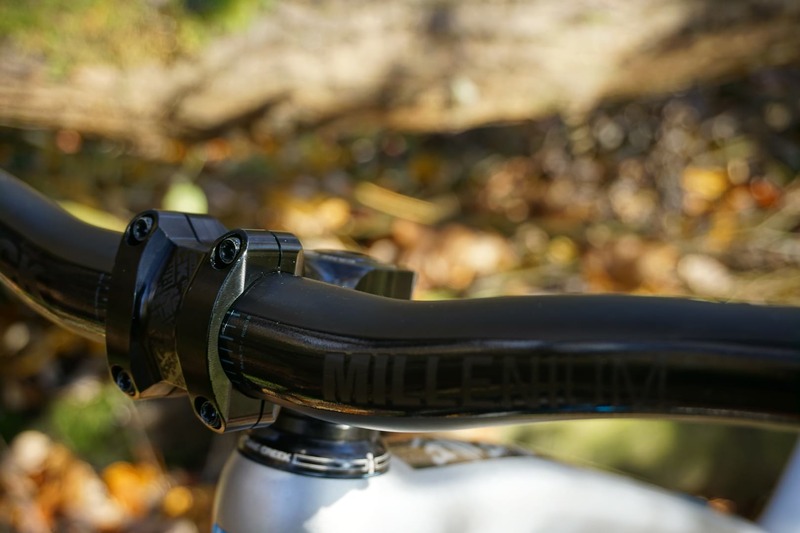 The low slung frame includes bottle mounts on the downtube and has plenty of room for a full size bottle. 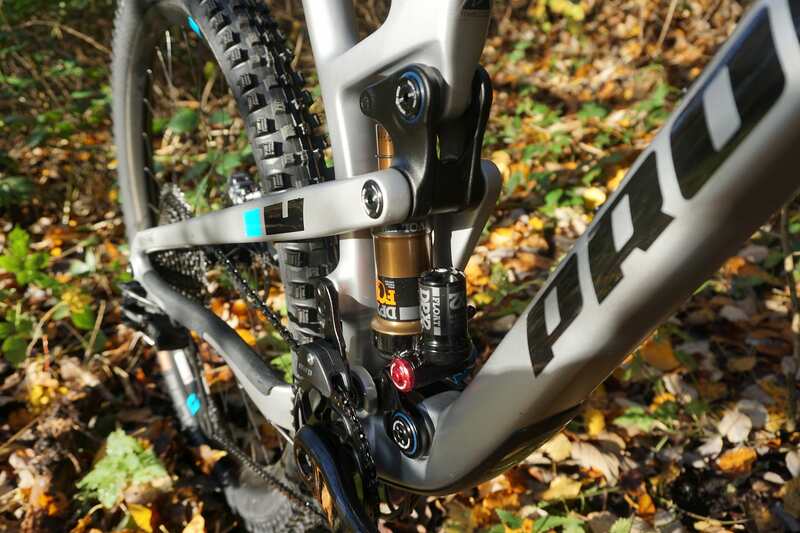 Both front and rear suspension are taken care of by Fox, with blingy Kashima everywhere you look. 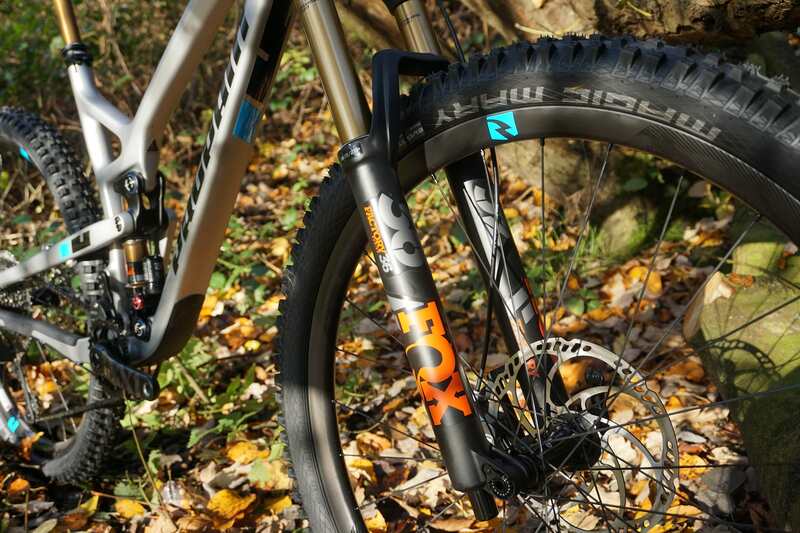 Up front is a stout chassis’d Fox Factory 36, paired with a Float DPX2 out back. 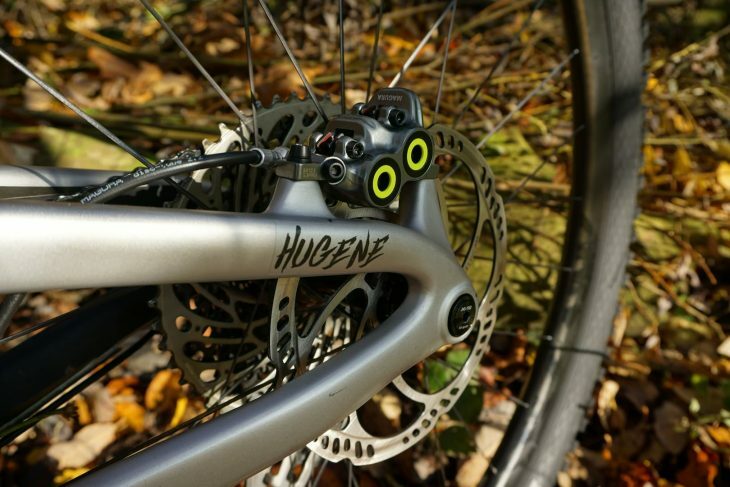 The Hugene is available with either a 140mm or 150mm fork and the model we have here has the 150mm version plugged in. 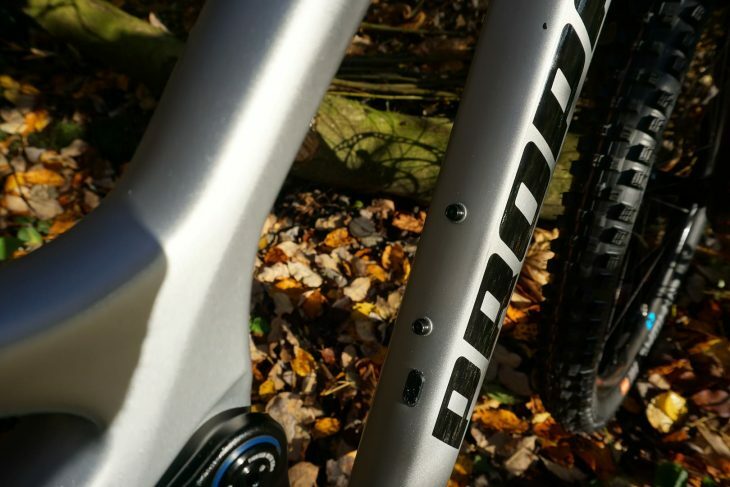 Rear travel remains the same at 130mm regardless of fork choice. 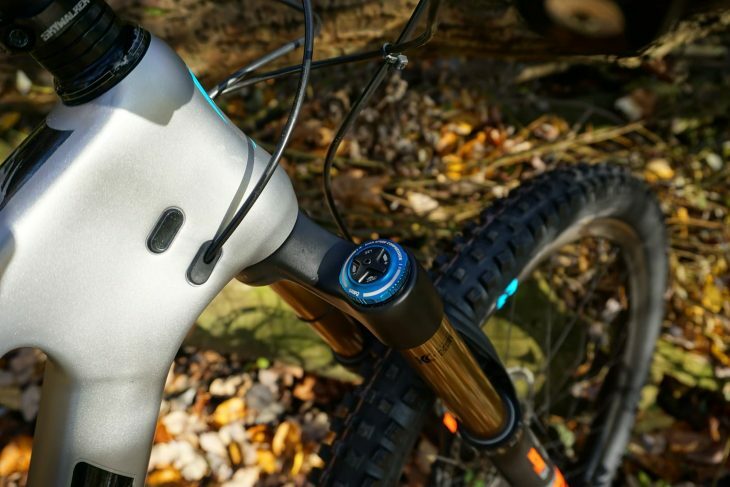 If you choose to go with the 140mm fork, the reduced A2C adds half a degree to both the headtube and seatube angles bringing those to 67.5° and 75° respectively. 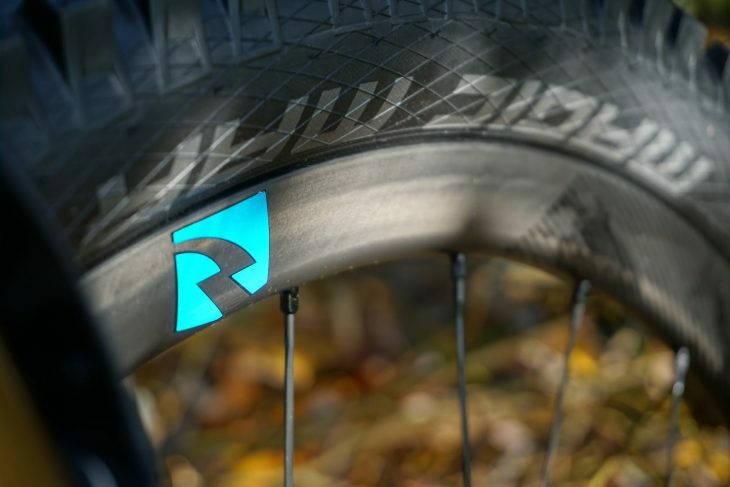 Continuing with the carbon theme, the Hugene rolls on a set of Reynolds Black Label Carbon 29 Enduro wheels. These are based around a set of tubeless ready, 28mm internal, asymmetric carbon fibre rims laced to Industry Nine hubs giving 3 degrees of engagement. Refreshingly, the wheels are finished off with a set of ‘northern winter’ suitable Schwalbe Magic Mary 29 x 2.35 tyres in Addix Soft flavour which should offer plenty of confidence inspiring traction in the ensuing slop fest. 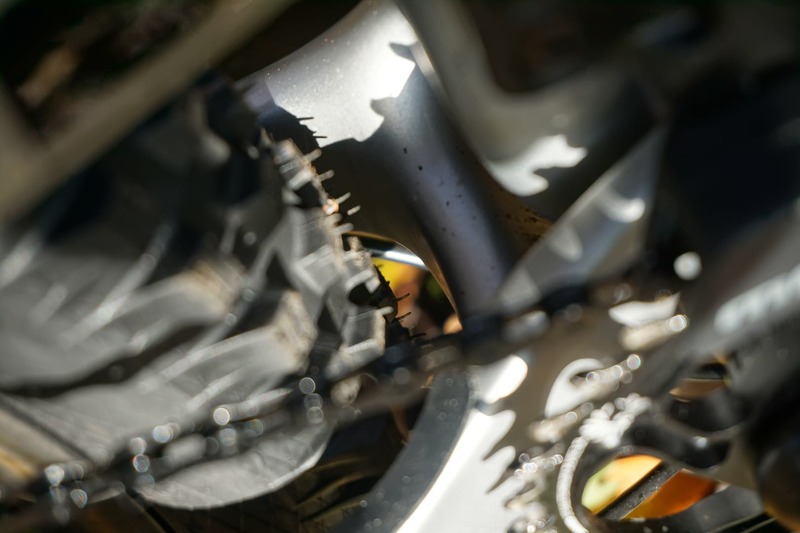 Drivetrain on the Hugene is a full SRAM 1 x 12 affair with XX1 rear mech, carbon cranks and 32 tooth chainring, and a massive 10-50 cassette for climbing up anything and everything. 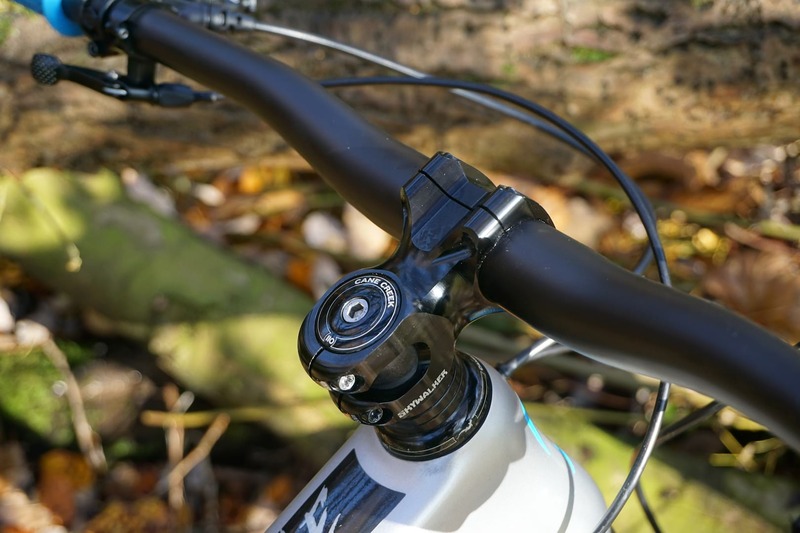 Braking duties are taken care of by Magura with a set of super powerful 4 pot MT7 brakes, with a big old 203mm rotor on the front and a 180mm on the rear giving plenty of power for when things get rough. Controls are provided by Sixpack racing with a Millenium 785mm carbon bar held in place by a Skywalker 50mm stem. 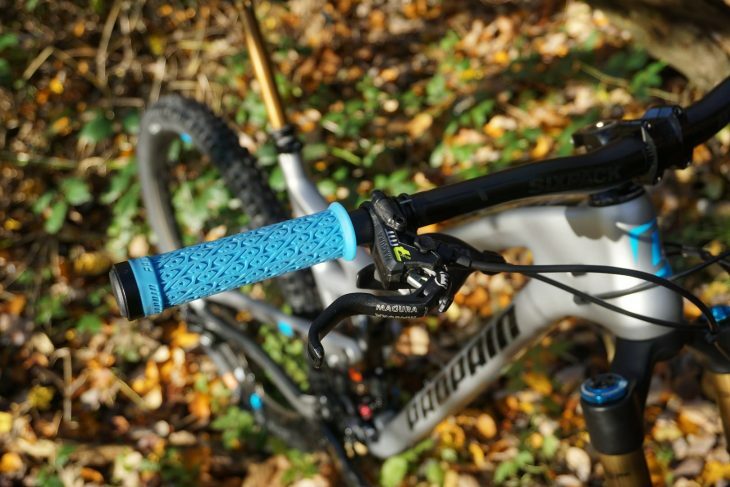 Grips are colour matched Propain own brand. Rounding out the components is a Selle Italia saddle mounted to Fox Factory Transfer 150mm dropper post which, of course, is in matching Kashima finish. We’ll be putting the Hugene through its paces over the coming weeks and will be back with a full review. Let us know what think of Propain’s do it all trail bike and if you have any questions pop them in the comments below and we’ll try and get them answered for you. 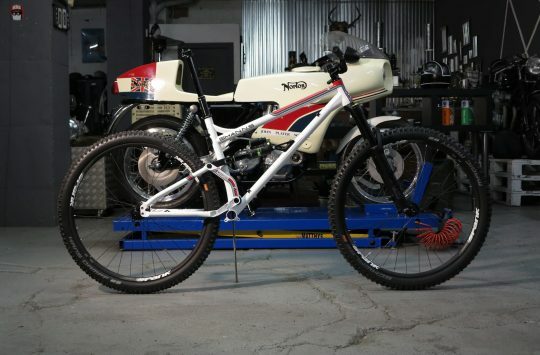 you say in the article than the bike is 140mm of rear travel. 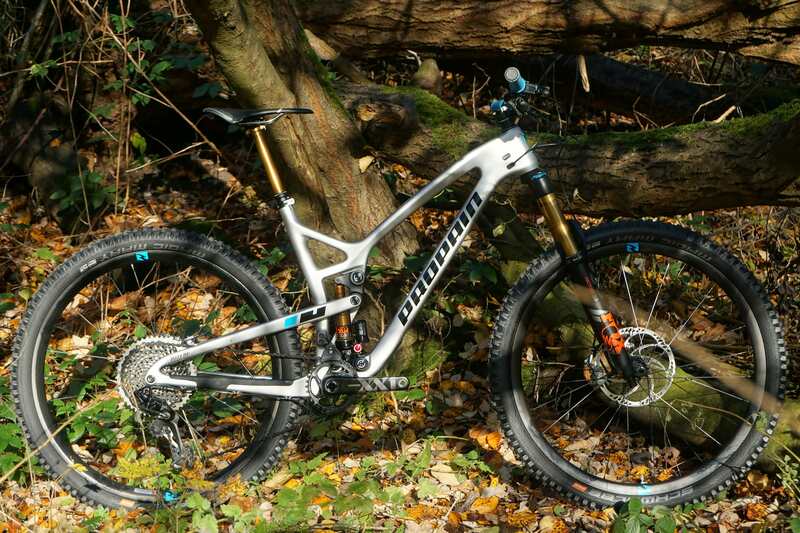 But on their website it’s speced as a 130mm rear travel. So who is right ? Good spot! It’s definitely 130mm and I’ve now updated that.